Daniel E. Olesen is a Danish writer holding a Master’s degree in Comparative Literature. When not searching for inspiration in musty tomes, he travels around Europe looking for castles to explore and calling it research. His first novel, The Eagle’s Flight, is available for free from his site, which also includes extensive background information on the setting of his stories. Other than writing fiction, he also writes a blog discussing literary theory, usually as it pertains to fantasy, and is currently writing a blog series discussing the image of the hero in Western society, from mythology and up to modern times. Follow him on Facebook to be updated on his writing and new blog posts. I’ve always imagined events around me and spun them together into stories. When I was 3 years old, I briefly got away from my parents in the town where we visited my grandparents. Getting home again, I told my grandmother, “Today, a little boy got lost from his parents at the marketplace.” At age 9, I read Tolkien and was overwhelmed at how one could create a world of such magnitude, and my fate was sealed. I started developing this particular story in my late teens, meaning it took me about 12 years, including 2 abandoned attempts of writing the first novel – I gave up when I realised I needed a lot more practice before I could write a novel. The sense of marvel and wonder in fantasy makes a great impact on me; it lets your imagination soar unlike anything else. By treading into the characters’ stead, you go on amazing adventures and experience victories against all odds, terrible betrayals, and so many other poignant moments. 3.You mentioned musty tomes and inspiration. Could you give us an idea of what books you look to? Do you have a reading list you can share with us? The three books concerning medieval life by Frances and Joseph Gies are excellent historical works to understand the details of this time period. The Discarded Image by C.S. Lewis explains the worldview and cosmology of the medieval period brilliantly and can be very fertile for inspiration. The Norse Eddas are one of my primary sources as well, both in infusing my books with a touch of Norse culture as well as how to understand how an oral society would preserve its history through songs and lays, and how these texts are structured. 4.Your book takes place in many realms, with many nations. How did you go about making them all unique? I imagined the early history, set long before my books, and how tribal migration would have made different cultural groups enter the area, settling and possibly displacing other tribes. Each of these tribes is inspired by the language and culture groups of our world, influencing their contribution to the vocabulary of my world’s shared language, their unique customs and society structure etc. In the first book, it is predominantly European cultures that serve as inspiration because that is the starting point of this story, but future books will expand to include Middle Eastern and North African inspirations as detailed as the others. 5.Your world sounds very well-developed and rich in political intrigue. How long have you been working on its creation? About the same time that the idea for the story began in my head, so same answer as earlier – when I was in my late teens or around 2004-2005. The most fascinating thing would be that there is no main character. There is a large number of characters, but each of them usually belong to a faction or simply has their own goals and motivations they are pursuing. I am a big believer in “everyone is the hero of their own story”, meaning I treat each character the same. I avoid describing the thoughts and feelings of any one of them, since such usually makes the reader root for that character or at the very least develop sympathy by understanding and knowing their thoughts and motivations. 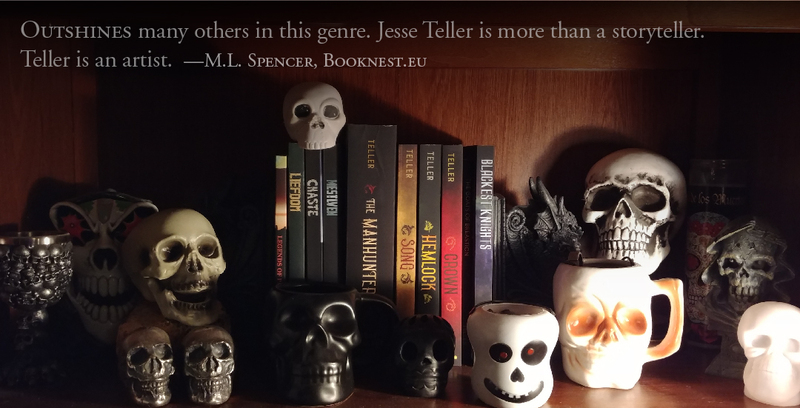 Instead, I simply describe each character from an outside perspective; this forces the reader to determine for themselves who can be trusted, what each character’s motivations are, and who to root for. 7.What character from your book fills you with hope? Maybe an odd answer, but I am going with Egil. He is a boy in his early teens, apprenticed to the king’s scribe; despite its unassuming title, it is one of the highest offices that a commoner can hold. Egil has a desire for knowledge and a curiosity about everything that I find endearing. Thanks to his apprenticeship, he also gets swept into adventures and dangers much against his own wishes, leaving him quite anxious on many occasions, which is probably how I would react myself in his place. 8.Without giving any spoilers, what is your favorite thing about this book? That’s a hard one to choose, but I think I will go with the friendship between Athelstan and Brand, and what happens between these two characters over the course of the story. For a long time, I found it excruciatingly difficult to write dialogue. There were simply so many ways for a character to phrase what they wanted to say, and I didn’t know how to choose the exact words. In part, it was due to being an immature writer and not having a sufficient understanding of the characters I was writing to grasp their speech patterns. I eventually began writing short stories to train myself that were almost entirely based on dialogue. This forced me to consider how to pack layers of meaning into what was said, because I had no other way of telling the story. Practising also helped me get better at imagining my characters’ mannerisms etc. including how they would speak. 10.When you are writing, tell me about the emotions that are running through you and what it takes to work alongside them. If I am writing something like a description, I imagine viewing it before my eyes – if it is an imposing castle, I feel a sense of awe perhaps, and try to get that across in the text. If it is a hovel, I might feel pity and put that into the words. When writing characters, I generally feel to some extent as they do. If they are angry, unhappy, merry, I put myself into their shoes and imagine their feelings, so I may know how they act and react in a given situation. This does mean I might sometimes disturb myself; if a character is furious, I eventually get up and pace around the room, feeling angry myself as I run this scenario through my head. Nothing to do but play it out and then return to my seat, finishing the passage. 12.You’re going to go back and visit yourself when you first started writing, at whatever age it was, and you can give yourself one piece of advice. What would it be? Keep going. This will take patience and discipline unlike anything else you’ve done before, and there’s nothing to do but keep going. 13.If you could change any one thing about the writing industry, what would it be? I would want it freed from the grasp of Amazon, so that book distribution could happen on the authors’ and readers’ terms. I would want authors to be bolder in seeking success in other ways unrelated to sales numbers, and readers to more actively support their authors, especially the indie ones that really need it.